The link is under her picture. I’ll send the song when I discover the problemm with attaching it to the actual post. 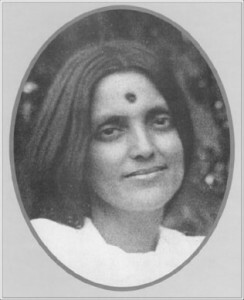 I’ve written a couple of times about the great 20th century Indian saint Anandamayi Ma. She is considered to have been an actual incarnation of the Divine Mother in Indian lore. She spent the last 55 years of her life traveling around India spreading her teaching of Bhakti Yoga to many thousands of devotees. Many of them have said her most amazing characteristic is that for anyone who was fortunate enough to have spent some time in her presence, they couldn’t help but have the desire to receive the divine presence awakened, or further enhanced from inside their being. One of her most powerful teaching methods is that of kirtan, the singing of devotional songs to the Lord, the Hindu name for the divine presence. I’m attaching her singing of ‘Hey Bhagavan’ which is Hindi for O’ Lord. The spirit of her song is the calling to the Lord to shower all beings with her love, while calling all beings to receive her love. If we just allow ourselves to open to her spirit, with persistent devotion, we will at least begin to have the actual living experience that there is nothing separating us from the love of the Divine Mother. One saying that I find myself continually coming back to is one of Nisargadatta’s sayings. “When I look within, I find that I’m nothing, and that’s wisdom. When I look without, I find that I’m everything, and that’s love. My life turns between the two.” The nothing he refers to in looking inside, is not the nothing of an empty glass. It’s the fullness of being no-thing, having no ‘own being’ separate from the awareness we are. This is the awareness of just being present that we share with all beings. Turning outward, the wisdom of being no-thing, the awareness of just being present, reveals the love and compassion of not being separate from anything. We realize are one with everything. This process of turning between the two is actually going on all the time within each one of us. The difference between a sage like Nisargadatta and us, is that in our self clinging we’re afraid of the world, and afraid of our inner no-thingness. We’re afraid of the intense loving energy of turning between these two aspects of our life. As we learn to allow a sense of deep silence to emerge in our meditation, the awareness of just being present begins to reveal itself. We’re actually beginning to access a whole new state of consciousness –one that is quite immense. By giving our attention to it in the midst of turning between the inner and outer worlds, we make ourselves more and more available to the dawning of of this vast expanse where we can awaken out of the belief and experience of separation. We realize we are a deep well of awareness – an inner expanse that’s always here. Because it’s always here, there is no need to try and grasp or hold onto it, we only need to become aware of its vast freedom and love that is openness itself. 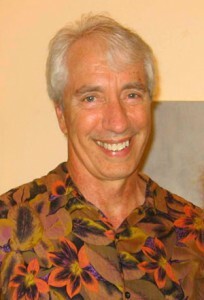 On entering the spiritual path, many people believe spiritual freedom is defined by what we are free from. In other words, we can be so transcendent that we are literally free from life. I’ve discovered that in this context, this is a relatively immature idea of freedom. Something more mature, something that develops and grows within us as we become more spiritually mature is not a freedom from, but a freedom to. Are we free enough and open enough to meet and occupy our life as a human being? Are free to suffer as well as free to experience joy? Even though we’re not separate, even though the whole universe is contained within us, there’s still a human component, and individual identity with the capacity to allow spirit to flow out into the world. We can either open to this, or shy away from it. The real joy we discover in our surrendering to the wisdom and love of the life of our true spiritual identity, is that by opening instead of shying away, the depth of our intimacy with love itself is deepened immeasurably. With the support of divine openness, we can begin to feel the freedom to deeply enter the question of ‘What is the experience of desire and fear?’ Can we find any actual substance to the experience? What is the experience of desire and fear actually made of? We can offer our experience of desire and fear to this divine openness, and in return our experience is absorbed back into spirit itself. We receive the love and freedom of the spirit of openness in action. It’s our activity, and is a divine gift enabling us to intimately know the freedom of loving this life. Teachers I’ve studied with over the years seem to be saying that In order to fully realize the truth and freedom of our being, all we need is to allow the inherent power of our spirit of inquiry to fully express itself. One very powerful aspect of our spirit of inquiry is its freedom. We begin to realize our inherent freedom when we allow the full expression of our longing that merges with our gratitude for life itself. Our spirit of inquiry is free in that it arises together with the free presence that is always here and now; there is no separation. Presence has no boundaries of width or height, space or time, and is free of all conceptual labels. It is free of the confinement of thought altogether. This means also being free to include thought, to include aliveness, to include love. Our spirit of inquiry enables us to freely ask the deep questions about life; who or what am I really? Is there an actual entity that we call me? What is the actual substance of the awareness that manifests the world, that manifests the idea of me? The ultimate question is to ask deeply: What is it really? Behind our wanting to know is a deep prayer from our hearts, our prayer of wanting to actually be freedom itself. The question of whether or not human beings have free will has been an on going mystery for thinkers of all kinds for millenniums. In our Western culture, we put a stronger emphasis on the individual self than in the East, where many of the great contemplative traditions originated. When we ask whether or not we have free will, we are usually assuming that we are asking whether or not our separate self is free to choose on its own. Does our self as we think and experience ourselves to be have the freedom of choice? Or are the thoughts and other experiences we have predetermined by forces outside of our awareness? With this type of asking, we are assuming that there indeed is a real entity that is our separate self. We assume that it is uniquely ours, and that there are indeed outside forces that can affect our experience of this separate self and its choices. Human consciousness has now evolved to the point where we now have the ability to deeply question and doubt this assumption of a separate self. When we develop the courage to stay with and test this deeply conditioned assumption in every aspect of our lives, we are tapping into the freedom of will that is much more powerful than we can comprehend with our mind. We gradually learn to surrender, and allow ourselves to be guided from within by this vast mysterious power leading us to the realization of what we really are. Some masters describe will as the process of realizing that thought is actually energy. Another name for will is the motivation of human activity for experiencing. It is always arising with, and interwoven with thought energy. We know we aren’t just our thoughts, because we can be aware of thoughts. That which is aware of thought energy is free; it doesn’t belong to, or confined by any entity we call self. There is free will, but free will is actually free of everything, free to be nothing and everything at the same time. It is simply free of all ideas of self or no self. Free will is you, the living presence we actually are is free, and its manifestations are the manifestation of freedom. What we think we are is a tiny flash of this freedom of living presence, our egos aren’t freedom, and can’t express free will by themselves. Our egos don’t exist by themselves; they are only this tiny brief flashing our actual living presence of freedom. So ego consciousness is always a tiny expression of the freedom of our infinite living presence. By simply offering all of our experience of being separate to our actual living presence, we begin to tap into boundless and timeless free will.